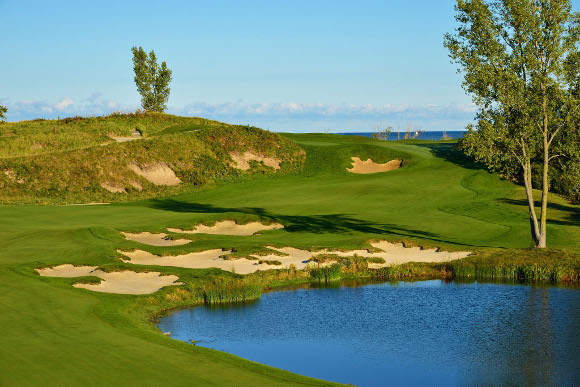 Just four years after opening for play, the Jack Nicklaus-designed course at Harbor Shores in Benton Harbor, Mich., is already host to a major championship for the second time. The 75th edition of the Senior PGA Championship—the second of five majors on the senior circuit—is set for today through Sunday at Harbor Shores. The Senior PGA Championship presented by KitchenAid airs today and Friday from noon–3:00 p.m. ET on the Golf Channel and Saturday and Sunday from 3:00–6:00 p.m. ET on NBC. Many things about this week’s event make the tournament worth tuning into—not the least of which is the star-studded field and the tournament’s rich legacy, which includes a 1991 Senior PGA title for the Golden Bear (one of Nicklaus’ record eight senior majors). But the setting itself is just as big of a storyline as any this week. The 6,852 yard, par-71 public golf course is intricately woven into the Benton Harbor community. And it’s a story of revitalization, hope, and the power of golf. Among Michigan’s poorest cities, with a median household income under $18,000, Benton Harbor is testing whether a state-run restructuring can foster rebirth. The $560 million, 530-acre Harbor Shores plan features houses priced up to $1 million on a golf course with a spectacular view of Lake Michigan. Parts of the sprawling course—its 18 holes take seven miles to walk—were built on land that was once scarred or contaminated. During the construction process, the development team removed over 117,000 tons of trash, solid waste and concrete, including 20,000 tons of contaminated soils. That’s one football field stacked as high as a seven-story building. A dowdy beach was overhauled with $2 million from Harbor Shores Community Redevelopment, the developer. In the end, they were able to revitalize an area and create a source of beauty and pride that showcases Benton Harbor and nearby St. Joseph to a national audience this week. Golf and water lure investors, said Jeffrey Noel, president of Harbor Shores and spokesman for home appliance-maker Whirlpool, a major contributor to the project. The year it opened, the course was named to Golf Magazine’s list of the Best New Courses You Can Play, and Links Magazine’s “Class of 2010: Most Significant Course Openings.” The Golf Course Superintendent Association of America and Golf Digest magazine honored Harbor Shores’ commitment to the environment with the Golf Course Superintendent Association of American (GCSAA)/Golf Digest’s Environmental Leaders in Golf Award, recognizing the course for excellence in resource conservation, water quality management, integrated pest management, wildlife/habitat management, and education/outreach. The full field that will compete at this week’s Senior PGA is listed below.